Dedicated in loving memory to my mother, Marilu, whose creative spirit will always be a guiding light in my life and to my father, Patrick, and all my sisters and brothers whose love and appreciation for our mothers paintings has inspired me to put this book together. A special thank you to my husband, Stan, for his unyielding encouragement and motivation to follow through with this project. On a solitary visit one day when my mother was sick in the hospital, I had a profound experience that I will surely never forget. It was a simple thing but one that moved me in a way that my words cannot adequately express. During that visit, I stayed with my mother for quite some time. While I sat with her by her bedside, I held her hand in my hand. After a time, she began to drift off to sleep. As she slept peacefully, I looked closely at her face, studying this woman who I called Mom. My attention then moved to her hand which still lay cradled in my hands. Gently stroking her slender fingers and feeling the softness of her skin and the warmth of her touch, I felt a closeness I had never before experienced. These were my mothers hands. It was as if I was holding her hand for the first time, brand new to me, yet so comfortingly familiar. These hands were so soft and beautiful and yet showed the wisdom and strength of a remarkable woman. These were the hands of a loving wife and mother of eight children and of a profoundly gifted artist. My mother expressed herself most vividly through her hands. Art was her passion and it permeated throughout all aspects of her life. From early in her life she expressed herself through her art, whether through sculpture as a young girl, or through humorously delightful illustrations found in her scrap books from her high school and college years. As she developed her talents over the years through continuing education and local art classes, she experimented with various mediums of art including charcoal, water color, egg tempera, acrylic and oils. Her greatest love, however, was painting with oils. 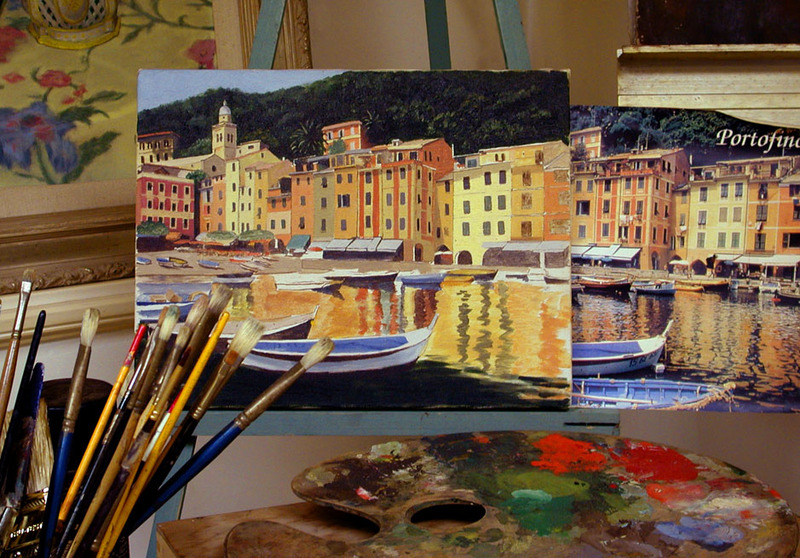 With oil paints she mastered the use of color, texture and light, and painted with extraordinary detail. My mother painted from her heart. She painted what she loved, still lifes with vibrant flowers and landscapes of places near and far that she visited. Perhaps the landscape was her favorite subject matter. From her many travels around the world with my father and their friends, she painted from photographs she took along the way. From a native village in Africa, to the colorful seaside town of Portofino, Italy, to a wooded walking path in the Arroyo of Pasadena, she brilliantly captured the beauty of any scene. And there were portraits. They were fewer in number but always skillfully painted. I have, hanging next to my bedside, a portrait painted of me by my mother when I was a girl of five years. I am grateful to have this painting as I look at it each day, looking into the eyes of this child who was once me, reminding me of the sweetness and innocence that my mother so simply captured long ago. My mother had a deep love for art history. For over twenty five years she generously shared that love with others as a docent at the Los Angeles County Museum of Art. Throughout her years as a docent, she was required to participate in art lectures and training to advance her knowledge and help prepare her for researching, writing, and memorizing all of her scripts for her illuminating tours. Over these many years, she gave tours on various genres of art including Egyptian, African and Pre-Columbian Art as well as Classical Art through the ages including Renaissance, Baroque, Rococco, Impressionism and Contemporary Art to name a few. I can remember taking her tour on a school field trip when I was in grade school and sneaking in to her tour group to surprise her one day during her final years at the museum. I was always so impressed and proud of her presentations. As long as I can remember, my mother was always in an art class. She was committed to fine tuning her skills and gleaning the talents and expertise of the teachers and peers she painted with. She often displayed her paintings in art shows associated with her current class and sold many of her paintings at the shows. I think this gave her the greatest satisfaction of all; knowing that someone beyond her family recognized and appreciated her great talents and found her paintings worthy of being placed in their homes to be admired for years on end. One of the most extraordinary accomplishments of my mothers art career was that of her cherished Christmas cards. For twenty seven years, she captured the likenesses of all her children creating holiday greeting cards that became legendary to all that received them. Every year, in the weeks preceding Christmas, Mom could be found working diligently away at her easel, drawing with charcoal pencil with impeccable precision and detail, all her children in a themed composition. Sometimes we appeared more saintly a family than we actually were, but nonetheless, they were works of art and a wonderful marker for the passage of time as our family grew in numbers and then eventually declined as each child moved out to go on with their adult lives. Another wonderful creation by my mothers hand was the mural she painted on the breakfast room wall of the house we lived in on June Street. From the floor to the ceiling along the width of the room she had painted an enchanted forest teeming with verdant plants, lush flowers and fanciful butterflies and insects. Taking a closer look, one would find several whimsical fairies merrily flitting about in this delightful land of make-believe. Each of these playful creatures represented one of her children which was a constant source of amusement to us all. My mothers artistry was not limited to drawing and painting, however. Her creative expression flowed through everything she touched as she was the embodiment of creativity. She was a wonderful cook and artful entertainer. She was adept at sewing and enjoyed the passage of time needlepointing. She could wallpaper a room, upholster a chair or refinish any piece of furniture. She had a green thumb and always had a thriving garden to tend to. She loved flower arranging and home decorating. She was a poet and and a talented writer. And personally, she had refined taste, great style and undeniable grace, an art unto itself. Towards the end of her life, it was painting that brought her simple joy; a chance to step out of her pain if only briefly, and connect once again to her craft. To this day there stands in her studio, an unfinished painting. It remains on her easel with paints and brushes nearby, never again to have the masterful hand of my mother, Marilu, stroke its surface, saturating it with color and light and love. In her art files, there are the photographs and picture clippings of landscapes and flowers also never to be painted. Taken from us in June of 1999, shortly after her seventieth birthday, the legacy of my mothers art lives on as we embrace the remaining body of her work collected in this book, a constant reminder of the profound beauty and extraordinary talents of this great lady. I am blessed to have known her, to have had her share her artistry with me, and to have touched my heart with her magnificent hands.